In our last blog post, we shared some ideas for crafty resolutions in 2014. On today's post, we have one more to add to your to-do list for 2014: make a project from start to finish as only a die-hard fiber fanatic can....from sheep to shawl! 'Sheep to Shawl' is an expression that means you learn everything you need to know to make a shawl from start to finish, from raw fleece to a finished fabric. Of course, you don't have to make a shawl from your finished handspun. You could just as easily go sheep to shoe or sheep to chapeau! 1. Select Your Fleece We've blogged about various breeds of sheep, and there are plenty of fantastic books dedicated to the subject as well. Perhaps you have a favorite breed of sheep to spin with, or would like to experiment with a new-to-you breed for this project. Carding processes raw or washed fibers to present them in a spiral fashion. This traps more air and makes a springier Woolen yarn which is more insulating, though it is not as long-wearing as a Worsted yarn. The most common fibers to be carded are cotton or wool, but a variety of fibers can be carded: alpaca, llama, soy fiber, and even dog hair! 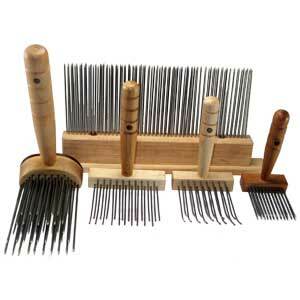 Combing produces a parallel presentation of fibers for Worsted or Semi-Worsted yarns. These yarns are longer wearing, smoother, and less insulating than woolen yarns. You can use a pair of hand combs or a single hackle; in particular, hackles are used for dehairing fleece and blending dyed prepared fibers. You can also watch this short tutorial video to learn more about the differences between combing and carding! 3. Get Spinning Now it's the moment you've been waiting for: time to spin your yarn! As we mentioned above, your method of processing the fleece will play a role in the finished yarn's outcome, but how you spin it will also play a part. While there is a lot more technical information on this subject which is covered in books, DVDs, and classes, we would like to touch on one subject: long draw vs. short draw methods of spinning. In general, the short draw method gives most spinners more control, whereas the long draw allows spinners to spin more consistently because they have a better view of the process as they work. We encourage you to experiment to see which method you prefer! 4. To Dye or Not to Dye You may wish to dye your handspun yarn before knitting or weaving with it (click here for more information on DIY yarn dyeing on this blog), or you may decide that the natural color of the fleece is perfect the way it is! 5. Weave, Knit, or Crochet Now it's time to find the perfect project for your handspun creation! Some of our favorite resources include KnittySpin, Weaving Today and Ravelry. We'd love to hear about your projects using handspun yarns over in our Ravelry group! We look forward to hearing about your sheep to shawl adventures in 2014!